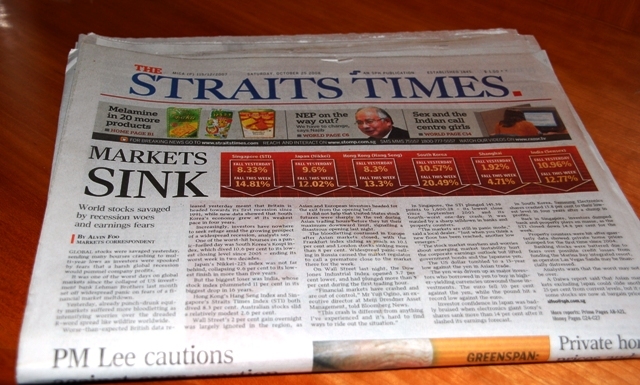 Our arrival to Singapore has rocketed us back into the 21st century (Oct 16). 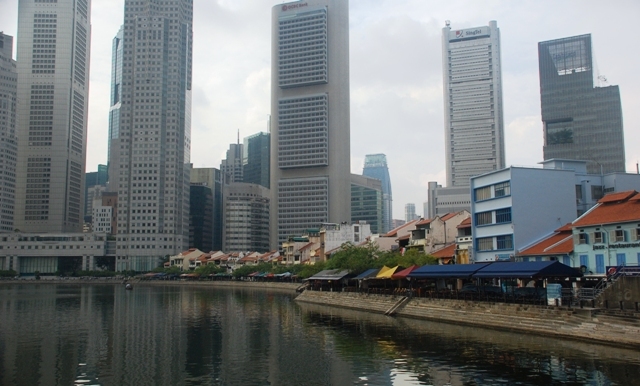 Singapore's land mass is a bit smaller than Texas...an island, a city and a country all in one with 4.8 million inhabitants keenly focused on world trade (1/3 of the world's shipping commerce and 1/2 of the world's oil pass through the Melaka Straits). However, that is nothing new since the Singapore River has been a crossroads of sea trade for more than 600 years...originally part of the Malay kingdom, later becoming a jewel in the British Empire's colonial crown for 140 years (British settlement was founded by Sir Thomas Stamford Raffles in 1819) and finally gaining full independence as a stable democracy in 1965 (led by Lee Kuan Yew). 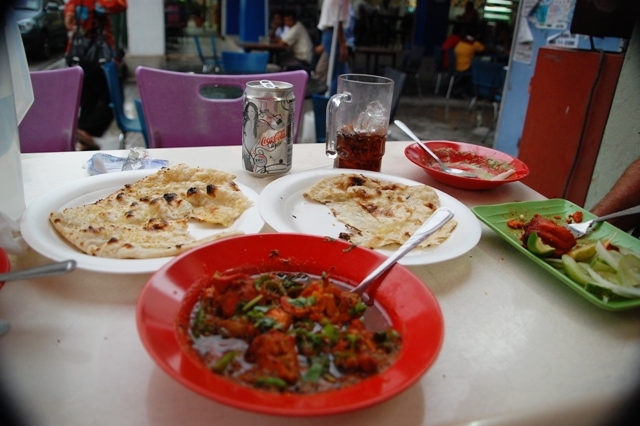 As a trade hub the area has always experienced high levels of immigration...indigenous Orang Laut, Chinese, Malay, Indians, Europeans and Arabs...resulting in, among other things, a mouthwateringly diverse food scene. 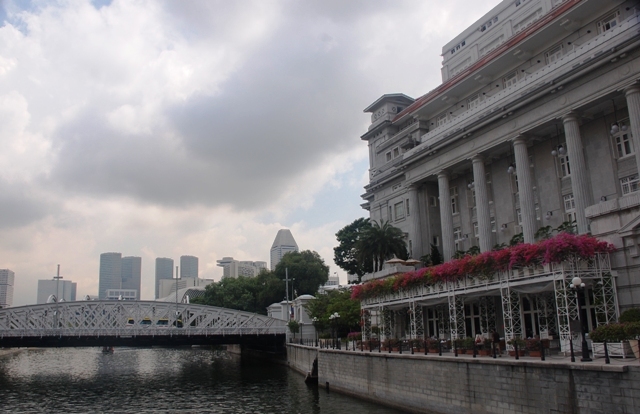 Stamford Raffles's solution to the flood of immigrants was to create separate districts throughout the town for each ethnicity. Although likely easier for new immigrants due to familiar sights and sounds it reduced integration in the long run. Southeast Asian spices were an early reason for trade with Europe...pepper and cloves were especially helpful in making European food more appetizing in the age before refrigeration. We had taste buds ready and shopping lists prepared. Oct 17 we made our first trip into town from Raffles Marina (www.rafflesmarina.com.sg). It took about an hour via marina shuttle and MRT (Mass Rapid Transit). 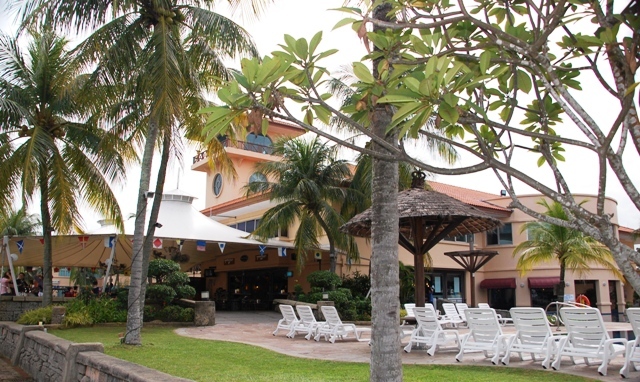 The roads are lined with lush palms and other tropical foliage with every building and mode of transport air conditioned (a real relief in this humid location nearly ON the equator). 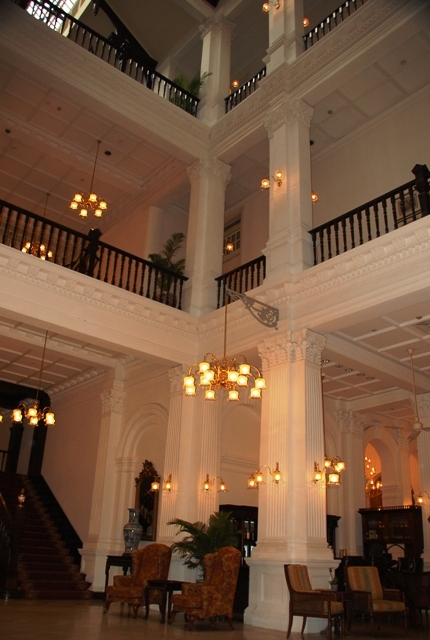 We started in the Colonial district with an elegant breakfast buffet at the Fullerton (www.fullertonhotel.com). Former home of the Post Office the stately dining room looked out across the river to the spot where Raffles first set foot on the island. We sampled our way through Eastern and Western dishes as well as fresh squeezed juices and aromatic coffee. Well fortified, we headed to the Asian Civilizations Museum at Empress Place (www.acm.org.sg). 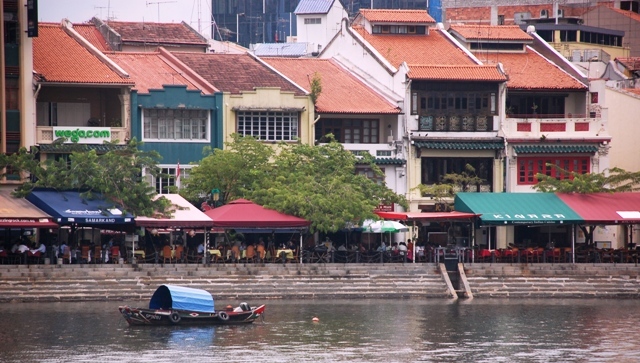 The grand building is filled with thematic galleries exploring different aspects of Asian life and contrasting the differences between the various Southeast Asian countries; religion, textiles, jewelry, weaponry, science, architecture...and the place they all came together...the Singapore River. 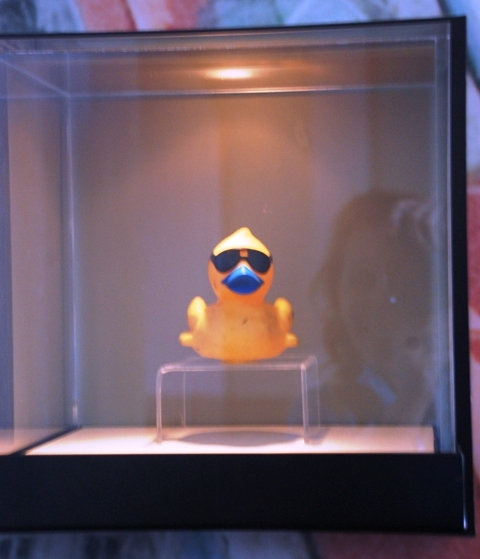 A bit of humor crept in, too, with a fundraising effort to clean-up the river in 2002...120,000 rubber ducks were floated down the river. 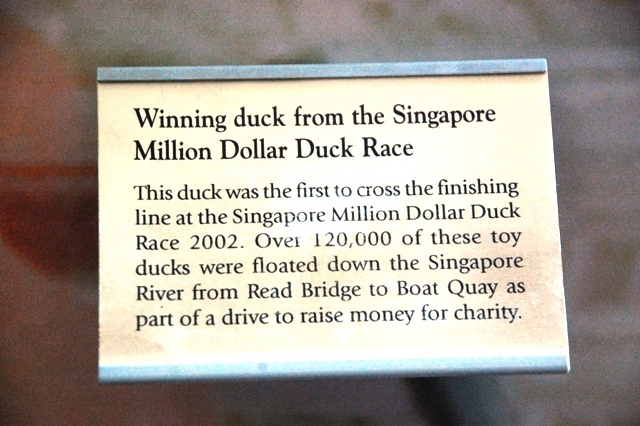 Kinda like a raffle...the first duck to complete the river run won $1 million. Oct 18 we fine tuned our shopping and headed for the electronics mecca of Sim Lim Tower and Sim Lim Square. 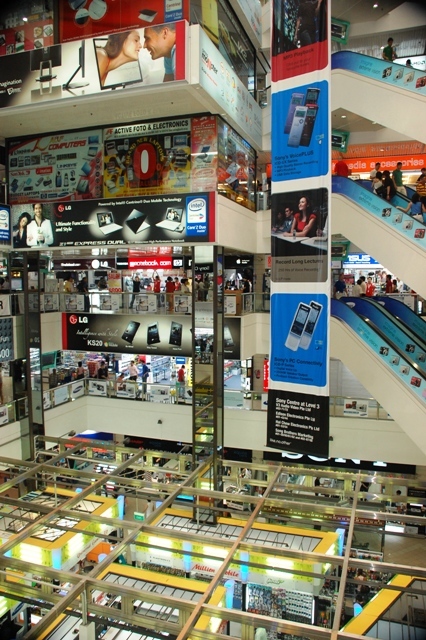 Holy cow, shopping is definitely a competitive sport in Singapore with floor after floor of shiny electronics, cameras and computers with hard bargaining a requirement despite the traditional mall type atmosphere. 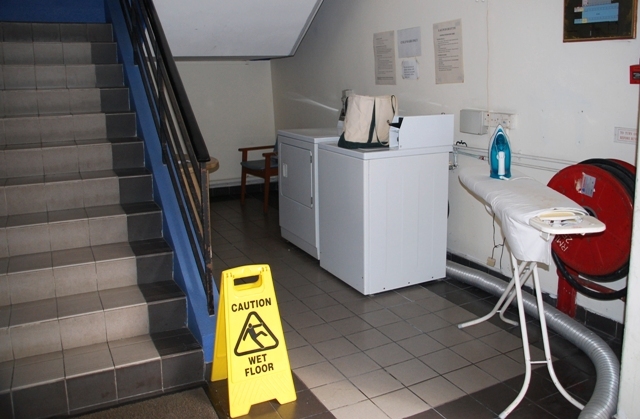 We found a couple of items and think we got pretty good deals...fingers crossed. 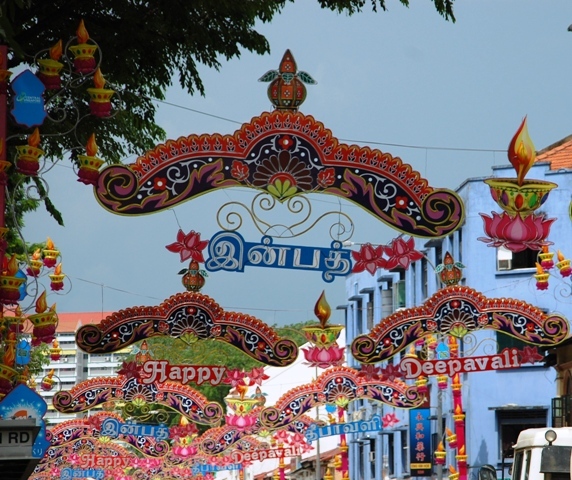 A walk through nearby Little India was full of vibrant colors and swimming with aromas. 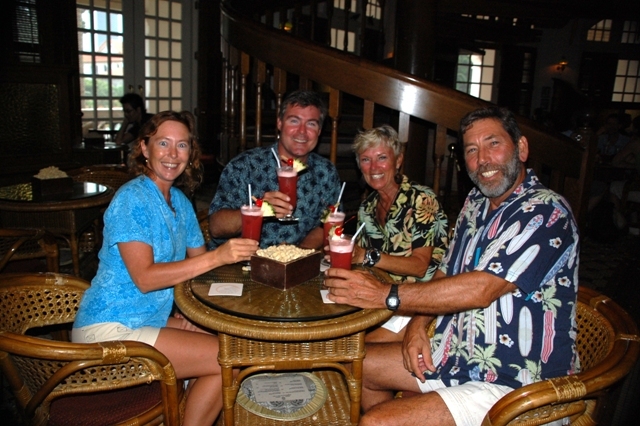 Next stop was the Long Bar at the Raffles Hotel for a Singapore Sling. The cocktail was originally created by bartender Ngiam Tong Boon in 1915. A bit sweet for more than one but a fun slice of the Colonial past. We opened roasted peanuts and threw the shells on the floor as we sipped our fruity concoctions. 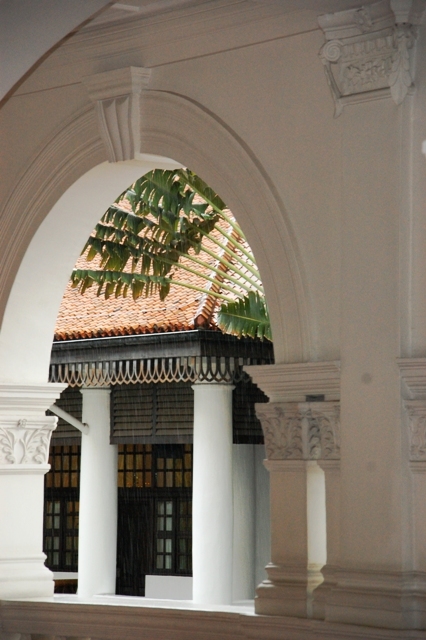 Raffles Hotel (www.raffles.com) was opened to the public in 1887 by the Sarkies brothers (immigrants from Armenia). Singapore Sling; 30ml gin, 15ml cherry brandy, 120ml pineapple juice, 15ml lime juice, 7.5ml Cointreau, 7.5ml Dom Benedictine, 10ml grenadine, dash Angostura Bitters...shaken over ice until frothy...garnished with a slice of pineapple and a cherry. Oct 19 was time for a bit of boat work. Chris and Terry were alternately hauled up the mast in attempts to diagnose a windex problem - it had been displaying bad numbers and a flashing screen. We had thought that a bird landed on it while at Lizard Island...but wiring and voltage checked out okay and there didn't seem to be any obvious bird damage. Next we pulled out the base unit from the dashboard, and brought it over to Terry's boat Sora and plugged it in to his system. Same errors and flashing screen! I guess the base unit is bad. Kind of annoying seeing that we pulled it out and gave it to a Raymarine guy in Darwin to test - and he (100 dollars later) said it was fine. Well, I guess it isn't. Oh well, 850 singapore dollars later we have a new one, installed and working great! Certainly works better than the dental floss we had tied to the side stay for the past 3 months! An afternoon at the pool felt decadent and was followed by a quiet night of hamburger and jalapeno pizza with a movie. Oct 20 and we ventured back into town to see the Chinatown neighborhood. 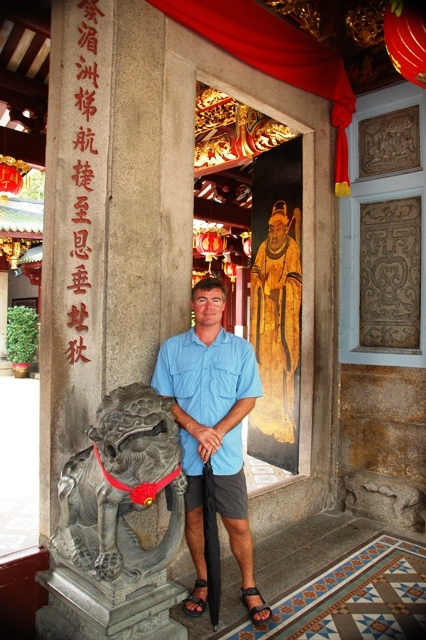 First was a stop at Thian Hock Keng Temple which was built between 1839 and 1842. 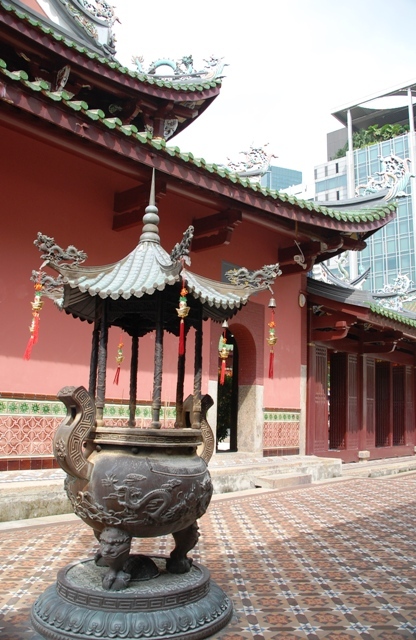 It is the oldest and most important Hokkien temple in Singapore. 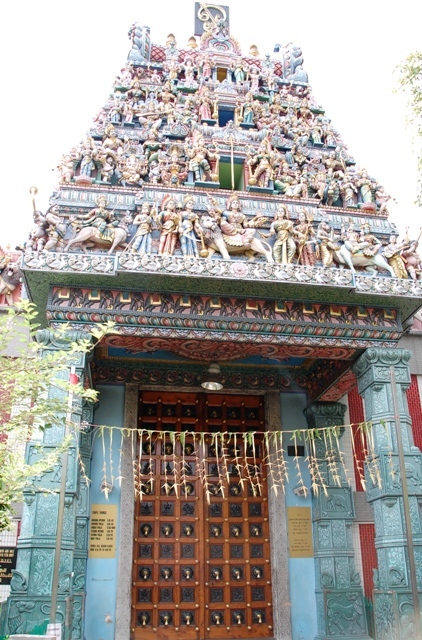 It contains a shrine to the Goddess of the Sea to whom we thought we should visit and pay our respects. 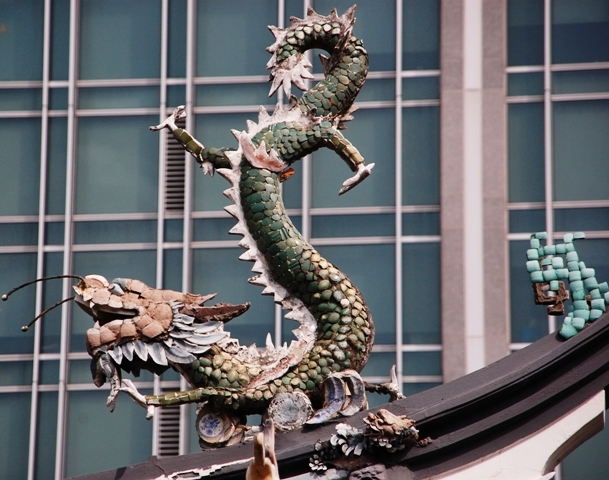 The gold paint was blinding and the roof dragons were fanciful. 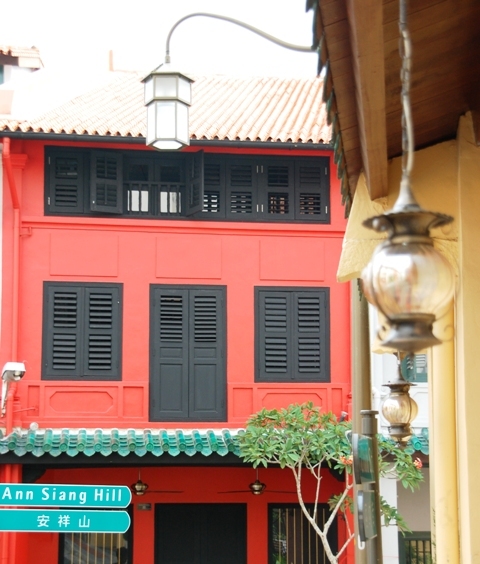 We strolled the backstreets to glimpse traditional, brightly painted shop fronts. These small neighborhood jewels seem to actually shrink below the mega-skyscrapers which tower over them. 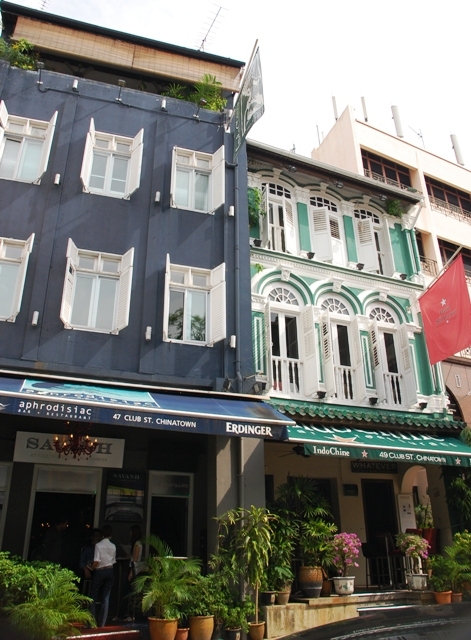 Our final stop was at Yixing Xuan Teahouse on Tanjong Pagar Road (www.yixing-teahouse.com). 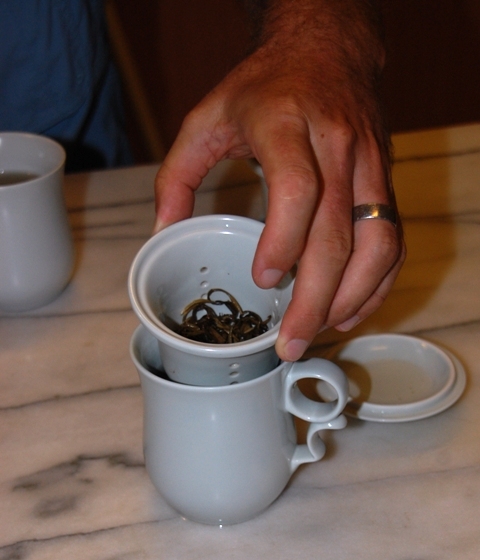 We chose from the four major types of tea; black, green, oolong and jasmine. Erin's jasmine smelled exactly like the flower but did not have the rich flavor of Chris's oolong. October 22 was boat day again. Chris changed all engine oils in record time and without a drop of spilled oil...that is a first. Great job! 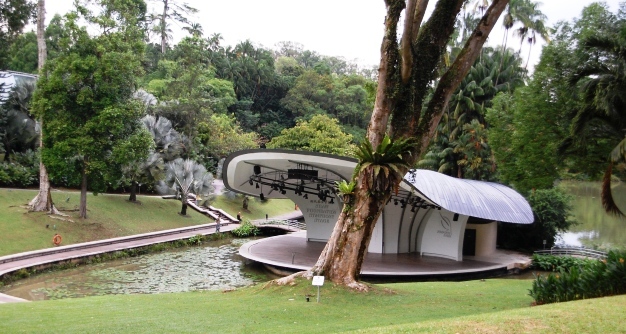 Later in the day we visited the Singapore Botanic Gardens (www.sbg.org.sg). 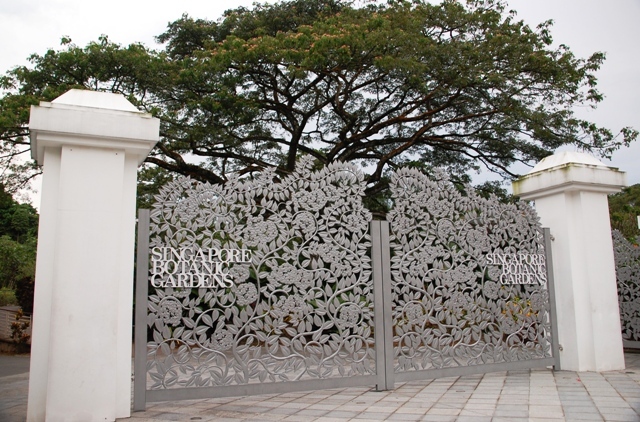 The gardens were originally conceived by Stamford Raffles in 1822 but it was not until 1859 that the gardens of today had their start. The early years fostered agricultural developments with much success regarding Para Rubber...a crop which brought great prosperity to Southeast Asia. 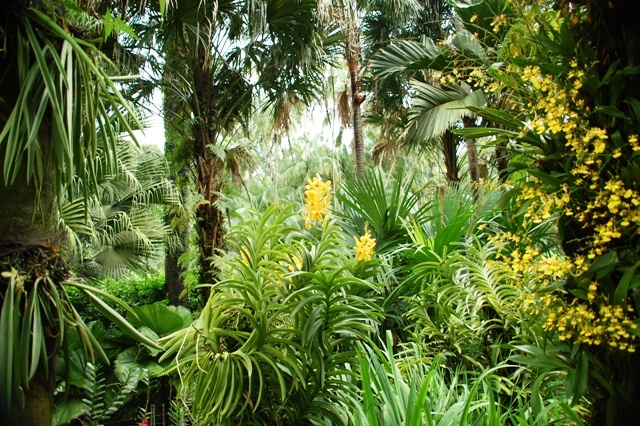 The 1920's saw a focus on orchid breeding. 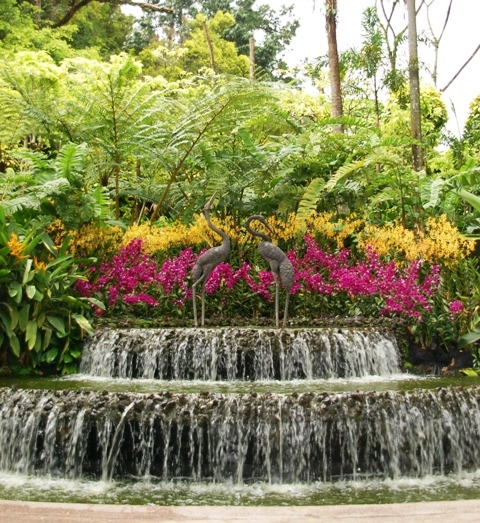 Today, the 155 acre gardens provide an escape from the city as well as active involvement in Singapore's Garden City program. 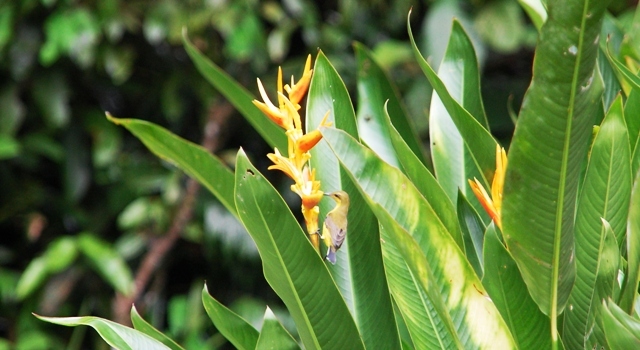 We strolled the paths and spied a tiny sunbird (much like a hummingbird) busy pollinating along the Heliconia Walk. The garden grounds are lush and verdant in this balmy atmosphere...complete with a "cool house" - which is different than Boston where we often have a "hothouse." 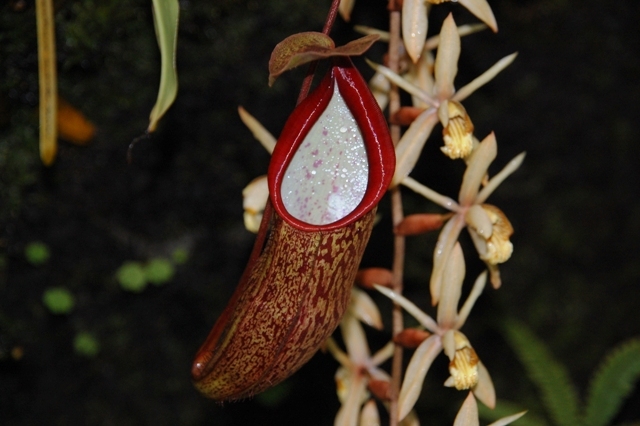 The cool house even contained a carnivorous orchid...the pitcher plant...eeek. The National Orchid Garden was truly spectacular...dozens and dozens of orchids in a rainbow of single colors, multiple colors and "tiger-striped" designs. 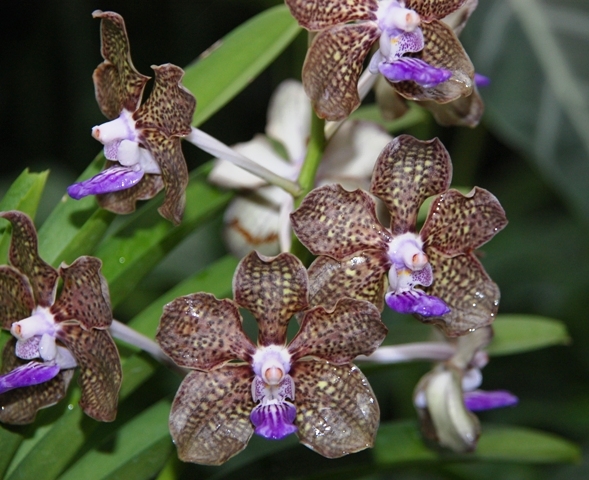 The national flower of Singapore is the hearty Vanda Miss Joaquim discovered in Singapore by Miss Joaquim in the 20th century. Erin got a book called Makansutra by K.F. 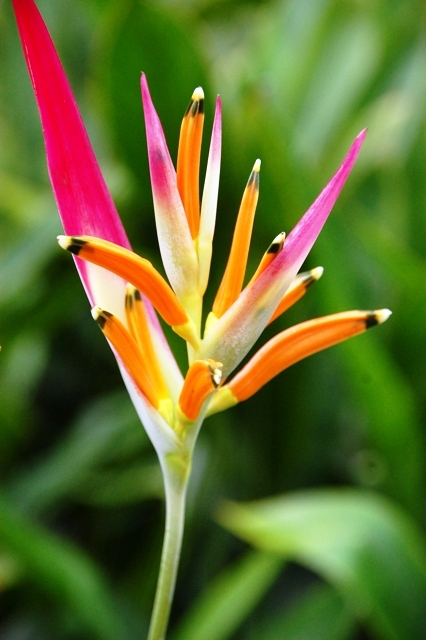 Seetoh (www.makansutra.com). This is like a Zagat or Michelin guide except on a much more granular level. Food is listed by dish instead of by restaurant. 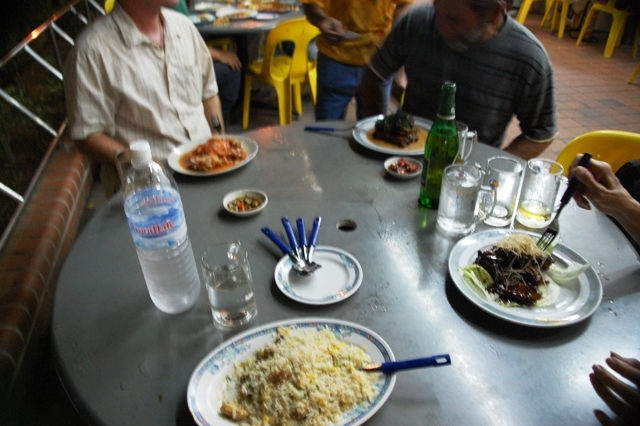 Most of the eating spots are informal hawker centers (much like food stalls) or humble sidewalk coffee shops. This is like looking for the best cheese fries rather than an "American" restaurant. 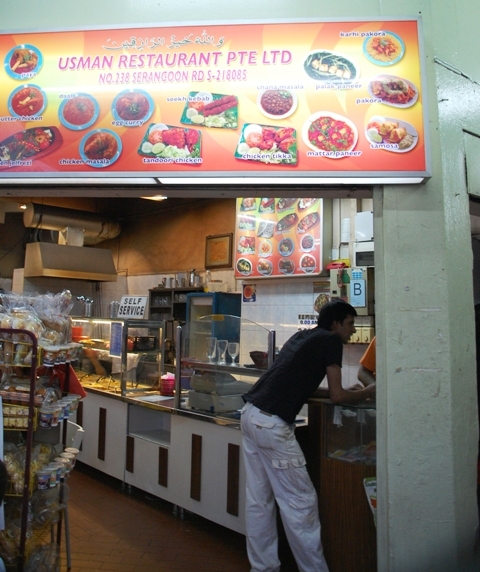 We dove in head-first and found a dinner spot in Little India known for its Tandoor creations...Usman Restaurant at 238 Serangoon Road. We sat at sidewalk tables in purple plastic chairs under an awning as the rain fell and kept the street scene moving. We ordered chicken tikka, chicken tikka masala, garlic naan, butter naan and somosas...napkins are an extra charge but necessary as we left no morsel untouched. Everything was delicious and we may have been a bit of the dinner show as the Indians around us snuck glances (or unabashed stares) at our noshing...tee, hee, hee. Energized with the Tandoor success of the night before Erin headed out in search of Chicken Rice while Chris stayed on the boat happily consolidating and organizing our 12,000 item song library onto our new (Sim Lim) 500 gig external hard drive. According to K.F. 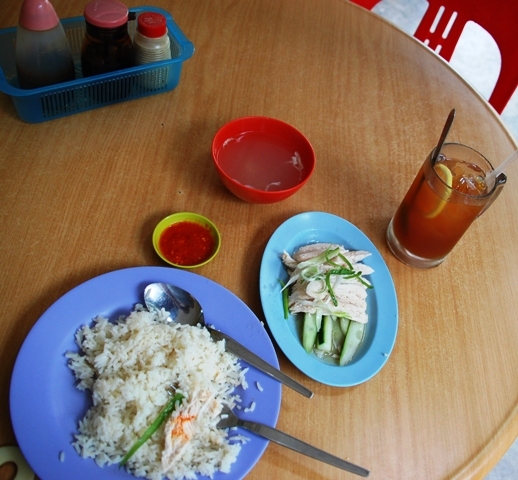 Seetoh chicken rice is Singapore's de facto national dish...originally created by the Hainanese from China which has evolved into cult status. Rice grains are fried in garlic, sesame and chicken oil before boiling in chicken stock. The sliced chicken is served with a plate of tasty rice with cucumber and a tangy chili dip, ginger sauce and dark soy sauce. To be honest it sounded a bit bland but Erin wanted to give it a try. 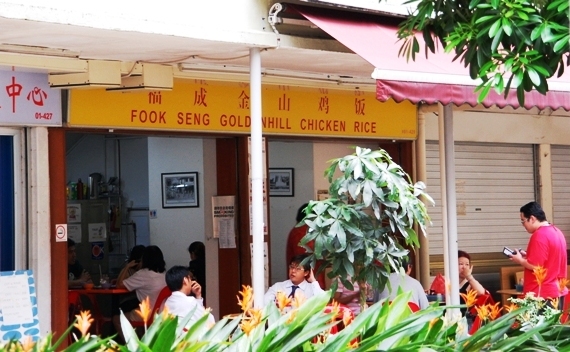 There are no less than 23 restaurant listings in Makansutra for chicken rice but the final choice was Fook Seng Goldenhill Chicken Rice at Blk 37 Jln Rumah Tinggi #01-429 (off Hoy Fatt Rd near Redhill MRT station). Seated and eager the chicken rice arrived...delicious but also so very soft. Back to Barefeet and there was quite a bit of excitement with the arrival of the Ericsson w25 cell phone modem...yes, the one sent to Bali is still languishing in customs (our little contribution to the Indonesian economy) but a new one was sent to Singapore. Chris is knee deep in wires and manuals and antennas...he could not be happier. Oct 24th it rained hard all morning, so computer stuff on the boat seemed the way to go. Chris got the Ericsson w25 sorted out. Holy guacamole...this is one cool contraption. Now we have a wireless network on the boat, all the computers can talk to eachother and reference each others hard drives. We also plugged in a phone, so you can call our boat with a Singapore telephone number. Chris had some fun calling himself on the boat by using skype on the computer. But better than just having a phone, we will also be able to get internet via cell phone towers! 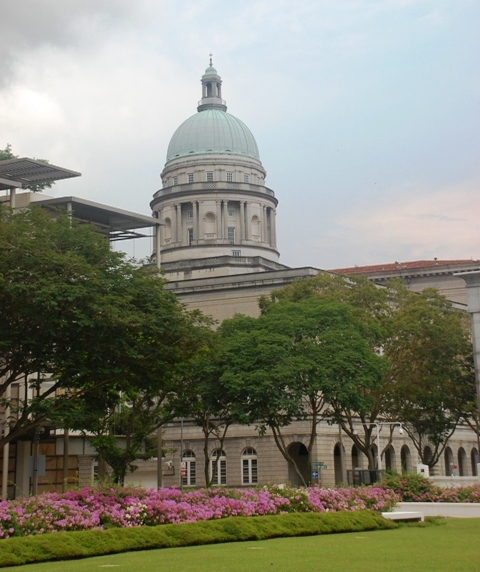 The rain lightened up and we headed to the National Museum of Singapore (www.nationalmuseum.sg). 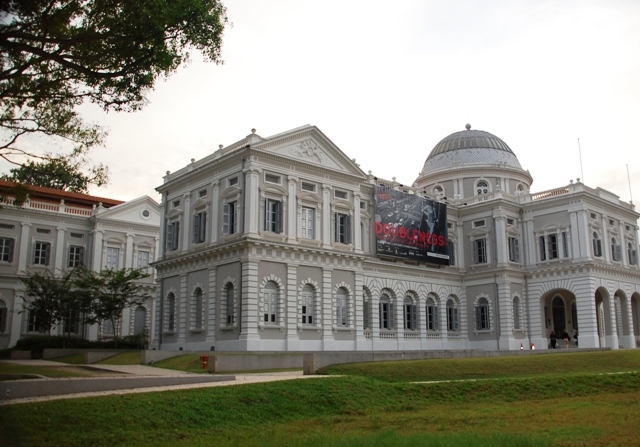 The neo-classical building built in 1887 houses a multi-media display of Singapore's history from the 14th century to present day. Each visitor receives a "companion" that is easily programmed as you explore the museum...allowing everyone to explore at their own pace and in their own style (e.g. via an events telling of history or of personal histories telling history). We scattered into four different directions but all enjoyed the experience tremendously. Near Bugis Street we found an outdoor coffee shop packed with people. 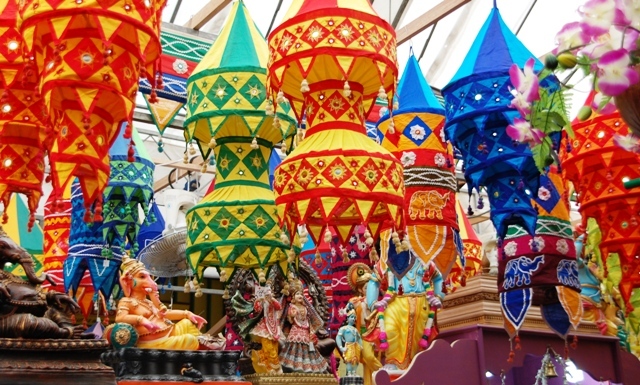 The street scene was active as tri-shaws (3-wheeled pedaled rickshaws) sped past with tooting horns and neon lights. Wrapping up odds and ends before leaving in a couple of days but Raffles has certainly spoiled us...even delivering a newspaper to the boat every morning...okay, maybe that isn't such a nice service due to the recent financial headlines. 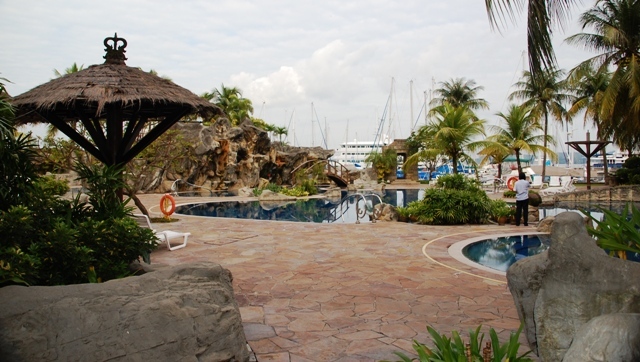 Final odds and ends included; laundry, provisions; found the lost "twisted D" shackle of the main sail, ordered supplies for work to be done on the full enclosure in Thailand, immigration check-out, duty free diesel...the usual drill. 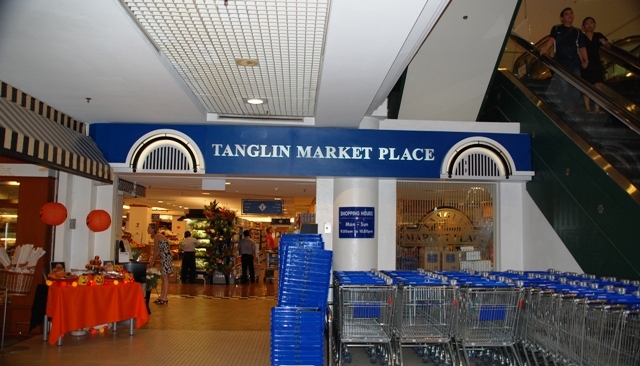 Oct 25 Erin and Karen headed into town for some American specialty items found at the Tanglin Marketplace supermarket. This place had items we have not seen for over a year; Lucky Charms, Velveeta, green chilis, molasses, powder Gatorade, Jelly Bellies, Pillsbury pie crust, Crisco, Ziplocs and Monterey Jack cheese. It was a bit like a Gelson's or Bristol Farms back home...pretty pricey but neat as a pin with uniformed employees and products we will have as special foods in the future. For example an apple pie. Hey, it's October 26! Happy Birthday Chris! This is the first time in two years that we have not been moving for his birthday...last year we were on passage from Fiji to Australia. Wow - we have covered a lot of ground in one year. Presents and blueberry pancakes started the day and an apple pie ended it. Off we go to Malaysia.